Located between Lower Manhattan and Brooklyn, Governor’s Island was off-limits to the general public for most of New York’s history. Initially a military outpost during the Colonial years, it remained a piece of federal land area strictly used by the military until 1996, when the Coast Guard closed its base there. The island sat pretty much unused for almost a decade as both city and federal authorities decided what to do with it. Since 2003 it has become a public park open to the public during the summer season extended to September 27th in 2015) , and for the rest of the year its buildings serve as a public school and also as housing for a handful of artists and workers. It has become a weekend destination for many locals – there are no cars on the island, so folks picnic, bike and relax around its streets. An artificial ‘beach’ was installed there, initially run by New York Water Taxi, and for a while it was the only place you could buy food or drink. That has been expanded, and now there are two food courts serviced by food trucks and also temporary pop-up restaurants that serve a variety of different kinds of food. They don’t allow you to take alcohol to the grounds (that doesn’t mean creative types can’t find a way to sneak something in), but there are areas where you can buy beer, wine or cocktails. Renata and I try to make it there at least twice during the season, and it’s a joy to do so. First of all, access is incredibly easy for us: we just hop on the Staten Island Ferry and walk over to the next terminal where another ferry will take us on a five-minute ride. On our first visit a few weeks ago, I prepared some finger food and drinks for a picnic, and we just lounged on the grass while I plucked at my ukulele. On our second visit following Labor Day weekend we just walked around and enjoyed the weather. We were supposed to attend a concert series in one of the houses but thanks to the lack of signage, we were unable to find the place where it was happening until it was time to leave. In the meantime, we enjoyed a performance by the West Point bagpipe band, explored Fort Jay and sat on the public rocking chairs inside the structure. 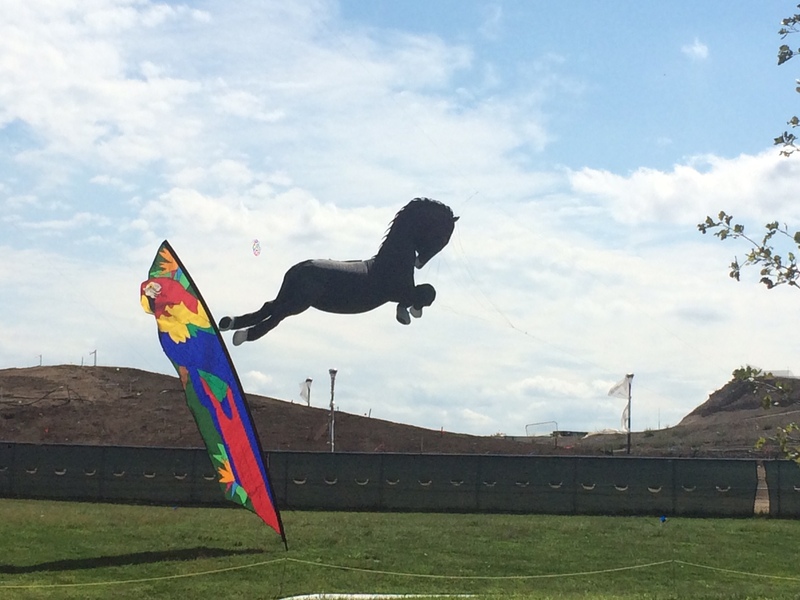 We later walked over to one of the food courts and enjoyed a drink and then checked out the kite festival going on that day – there were kites of all kinds, including a life-size horse replica. 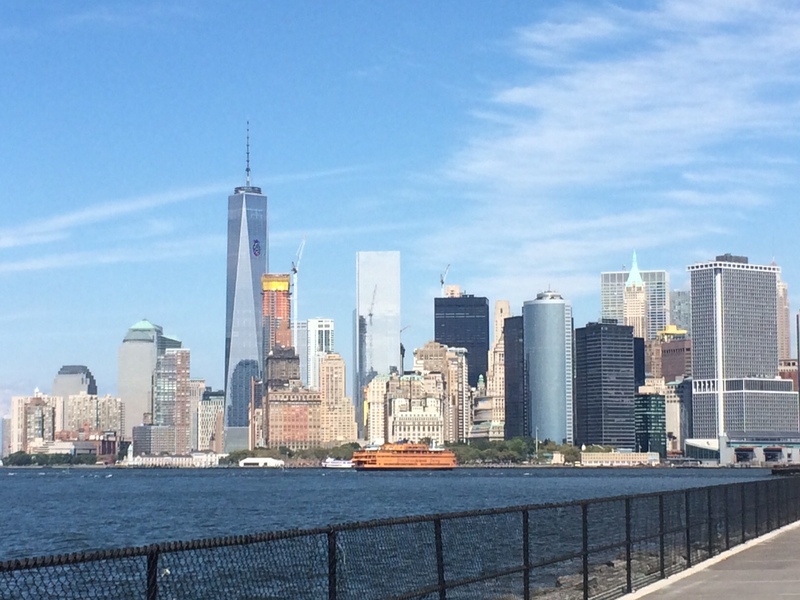 We also took in the dramatic views of Lower Manhattan and the Statue of Liberty, pretending for a minute to take in the tourist experience for a change. I am still looking forward for at least another visit before the season ends – it would hurt to have to wait all the way to the spring of 2016.